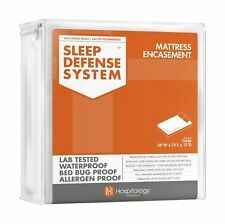 HOSPITOLOGY PRODUCTS Sleep Defense System - Waterproof/Bed Bug/Dust Mites ..
· Fits up to a 22" mattress in Twin, Full, Queen, King, Twin Extra Long Deep, California King, Split California King. Snug fit and easily removable fitted sheet-style stretches to fit mattress securely. With this mattress pad, you can revitalize an aging mattress, change the softness or firmness, or give yourself an extra layer of luxury to sleep on. Quilted mattress pad cover is durable and long lasting and is significant for two main reasons that are, to keep your mattress free of stains and to prevent exposure to dust mites and other potential allergens. 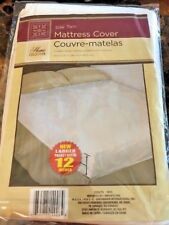 Fits Mattress Size 48" x 76". 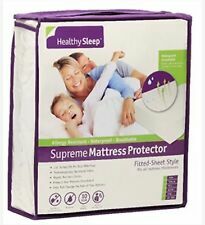 Sleep Number Kids Twin Mattress Pad Waterproof Stain Protect Hypoallergenic NEW! With the Sleep Number mattress pad, your child’s mattress is protected from almost any stain life can throw at it. No leakage at all. And yet the cover is soft, breatheable, no irritating plastic feel or sound. The Bamboo Mattress Protector is designed for a great night’s sleep. It is constructed from ultra-tech polyester and viscose rayon that are derived from bamboo blends which keep you cool and comfortable throughout the night. 5 Zones of support provide just the right amount of comfort and pressure relief. Foam is CertiPUR-US certified for quality standards. Infused with temperature regulating gel beads that capture and dissipate heat to help prevent overheating. If you did not receive our reply. 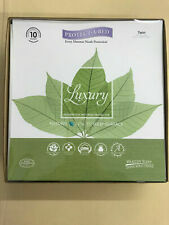 New In Box Bedsure Twin Size Mattress Pad. The textured design also improves breathability for a more comfortable sleep climate. The texture of these zones also improves the airflow of the foam for a more breathable sleep climate. - Add this topper to your mattress, then breathe deeply, relax and sleep well.